Phi thickenings, bands of secondary wall thickenings that reinforce the primary wall of root cortical cells in a wide range of species, are described for the first time in the epiphytic orchid Miltoniopsis. As with phi thickenings found in other plants, the phi thickenings in Miltoniopsis contain highly aligned cellulose running along the lengths of the thickenings, and are lignified but not suberized. Using a combination of histological and immunocytochemical techniques, thickening development can be categorized into three different stages. Microtubules align lengthwise along the thickening during early and intermediate stages of development, and callose is deposited within the thickening in a pattern similar to the microtubules. These developing thickenings also label with the fluorescently tagged lectin wheat germ agglutinin (WGA). These associations with microtubules and callose, and the WGA labeling, all disappear when the phi thickenings are mature. 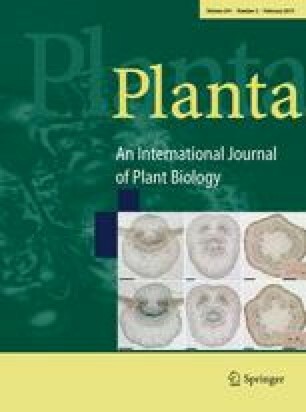 This pattern of callose and WGA deposition show changes in the thickened cell wall composition and may shed light on the function of phi thickenings in plant roots, a role for which has yet to be established. The online version of this article (doi: 10.1007/s00425-014-2194-z) contains supplementary material, which is available to authorized users. We thank Manfred Ingerfeld for microscopy technical support, David Conder (School of Biological Sciences) for help maintaining the orchids, Dr John Clemens (Christchurch Botanic Gardens) and John Clements (Canterbury Orchid Society) for supplying the orchids. NAI acknowledges the Malaysian Education Ministry for the PhD scholarship (SLAB) and funding by School of Biological Sciences at the University of Canterbury.